This view of the Curiosity rover's surroundings on Mars was assembled from black-and-white photos sent back by the navigation camera on Sol 2 and Sol 12 of the mission. Doug Ellison of NASA's Jet Propulsion Laboratory filled out the Martian sky artificially, using the lighting values from the pictures that were acquired. NASA's Curiosity rover has sent back its sharpest image of the 3-mile-high (5-kilometer-high) mountain it will climb on Mars. The mountain, known as Mount Sharp or Aeolis Mons, towers right in front of the rover in the middle of 96-mile-wide Gale Crater, where Curiosity landed two weeks ago. The shadow of the rover's mast is visible in the picture, which incorporates fresh imagery from the six-wheeled robot's navigation camera system. The high country of the crater's rim rises to the left and the right of the mountain. Black-and-white frames showing Mount Sharp's summit in all its glory were received overnight. Doug Ellison, a visualization producer at NASA's Jet Propulsion Laboratory, added the mountain vista to a 360-degree panorama of the rover's surroundings, and filled in the rest of the sky based on the lighting data he had at hand. The earlier Navcam panorama showed the crater's towering rim, but did not take in the upper reaches of the mountainside. A separate color panorama, provided by the rover's Mastcam system, is being filled out but does not yet include pictures of Mount Sharp's peak. The main objective of Curiosity's two-year, $2.5 billion primary mission is to make its way to Mount Sharp and document billions of years of the Red Planet's geological history by analyzing the different layers of rock along the mountainside. Studying the geology and chemistry of Mount Sharp's various strata could tell scientists how habitable the planet was in earlier epochs, and how Mars has changed since then. Project scientist John Grotzinger said on Friday that Curiosity would study its relatively nearby surroundings during the first few months of the mission, then start out in earnest for Mount Sharp by the end of the calendar year. It may take one Earth year for Curiosity to get to the foot of the mountain, and the trek to the higher elevations may well require extending the mission beyond its primary phase. Grotzinger and his colleagues are hoping that extension will happen: The primary missions for Curiosity's older, smaller siblings — NASA's Spirit and Opportunity rovers — were set to last 90 days, but both of those solar-powered rovers lasted years longer. Opportunity is still at work, more than eight and a half years after its landing on Mars. The 1-ton, car-sized Curiosity is a much more capable rover, and it has a nuclear power source that could continue to generate electricity for decades. Mount Sharp is the name commonly used by the Curiosity team, to honor the late Caltech geologist Robert Sharp, but the mountain's formal name is Aeolis Mons, according to the International Astronomical Union. 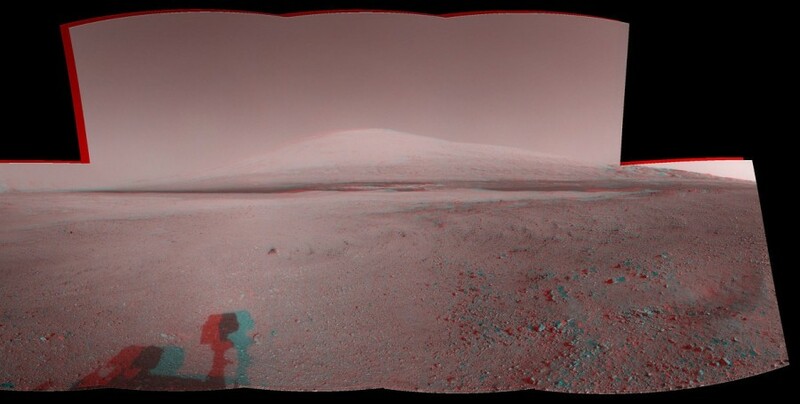 For extra perspective on the mountain, check out this 3-D view produced by Ellison, as well as a newly released picture of Mount Sharp's central mound, taken from above by NASA's Mars Reconnaissance Orbiter. The viewing angle for the orbital image is 45 degrees from the side, as if it were being seen from an airplane window. Doug Ellison of NASA's Jet Propulsion Laboratory assembled this stereo view of the Curiosity rover's surroundings on Mars using imagery from two of the imagers that are part of the rover's navigation camera system. Red-blue glasses are required to get the stereo effect. A long strip of imagery from NASA's Mars Reconnaissance Orbiter shows the central mound of Mount Sharp, as well as the sand dunes surrounding the mountain. The colors have been stretched to emphasize differences in surface composition. (That means the sand dunes are not really blue.) Although this image was acquired after the Curiosity's landing, the viewing angle is such that none of the spacecraft's hardware is visible in this image.